Dictionaries define "hamburger" as ground beef or a patty of ground beef. The popular usage of the word hamburger comes from the use of ground beef grilled as a patty, surrounded by a bun and served at fast-food restaurants. Ground beef, hamburger, ground chuck, ground sirloin and the various labels identifying the nutritional content of each can create consumer confusion. Grocery and butcher store packaging of ground beef also adds to the identity confusion. Grocery markets sell more hamburger, a generic term used for cuts of ground beef, by volume than any other food item. Commercial food chains, small local markets and big box stores carrying food items label hamburger either by the cut of meat or by the fat content of the ground meat. Typical cuts of ground beef, according to Davey Griffin, an Extension Meat Specialist at the Texas Agriculture Extension Service, include chuck, sirloin and round. Federal law limits the maximum fat content for ground beef to 30 percent, or 70 percent lean. If the ground beef meat product includes water, binders, phosphates or any meat sources other than beef primal cuts and trimmings, the product cannot be labeled "ground beef." Ground beef product with additives carries the label "hamburger." Meat grinding tenderizes dryer and less flavorful cuts to make them more tasty to diners. The U.S. Food Safety and Inspection Service reports beef producers grind less tender cuts of beef with higher-quality beef cuts. Beef graded under U.S. Department of Agriculture regulations includes canner, cutter, utility and commercial cuts. Higher-quality cuts feature store labels with the terms "prime", "choice," "select" and "standard," according to the inspection service. Ground beef typically does not undergo a grading process and may include cuts from any of the beef grades. A "ground round" label indicates the leanest category of ground beef. Foods made with ground round cuts include low-calorie diet meat loafs and combination dinners, including pastas and foods such as enchiladas or burritos. Ground chuck labeling indicates tenderized meat taken from prime chuck meat. As a rule, ground chuck includes less fat compared to hamburger and other cuts of beef. The meat shrinks less during cooking and also provides a fat content that adds flavor, according to the Fort Valley State University College of Agriculture, Home Economics and Allied Programs. 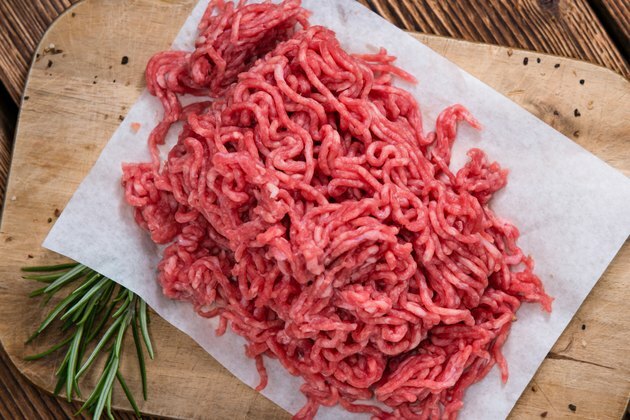 Chefs and home economists recommend ground chuck for making grilled burgers and Salisbury steak. Although ground sirloin provides less fat and a higher grade of ground meat, the Fort Valley State University College program reports many people cannot taste the difference between ground chuck and sirloin. Ground chuck typically costs less per pound compared with ground sirloin. Ground beef marketed as simply "hamburger" creates consumer confusion, and not all stores label ground beef products. As a rule, the whiter the ground beef color, the higher its content of leaner and less fatty meat, according to meat specialist Davey Griffin of the Texas Agricultural Extension Service. How Lean Is Ground Chuck?